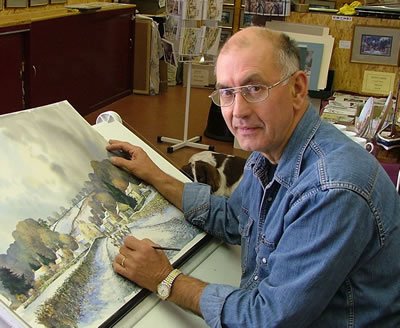 John Freeman is well known for his paintings of the North Yorkshire landscape, and in recent years, working almost exclusively in water colours, has established a reputation for his exciting snow scenes of the area creating a combination of clarity and warmth not often found in this type of subject. A selection of his work is now in print and it is proposed to add regularly to this collection of over 100 subjects in both open and limited editions. John's recently extended studio, located in the heart of Whitby's East Side, is light and spacious and shows over 160 of his works. His range of subjects also include his highly collectable Nocturne paintings, studies of H.M. Endeavour and a host of local places of interest from the very popular Goathland to remote moorland farms.